Buying your engagement ring from a custom jeweller gives you better value than buying from a retail shop. The main draw is creating your own design and it costs lesser. I recently proposed to Ellis with an engagement ring from JannPaul. Their service was excellent and I highly recommend them to anyone who is preparing for this important event in their life. Retail jeweller are well known because of the constant marketing and advertisements. I have seen their advertisements on the TV, newspaper and from walking around in the shopping malls. 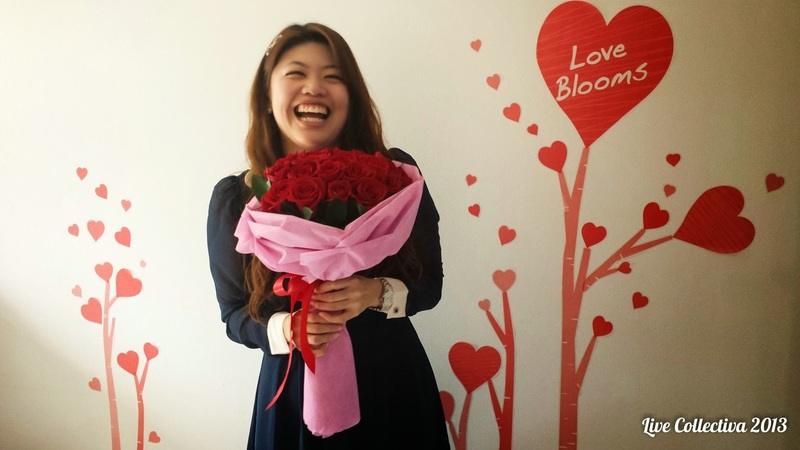 Lee Hwa, Soo Kee, Tiffany are some the famous brands. The jewellery shops display the jewels under such bright lights, it sears your eyes and leaves a black spot in your retina after you look away. Compared to the big names mentioned earlier, the custom jewellers are lower profile - their names spread by word of mouth. Searching online, you will turn up names like Fairy Inc, Ling Jewellery, Vivo Diamonds. With a custom jeweller, you choose the diamond first then decide on the ring setting you want. Ask to look at their past designs to get a feel of their style. That is not all. There is an even cheaper way to get your diamonds - from a reputable online retailer. A popular one is Blue Nile which sells a variety of diamonds and rings which you can search and filter. If you wish, you can even ship only the diamond to Singapore and get it fitted on a ring by a jeweller. I used their search function to find a diamond as close to the characteristics of mine and see that it is about 15% cheaper. If you have wire transferring thousands of dollars and receiving diamond by post is your kind of thing, this is the way to go. While many of us know those shiny carbon crystals as diamonds, few understand why the diamond costs so much, in upwards of thousand dollars. It is a combination of monopoly and marketing. 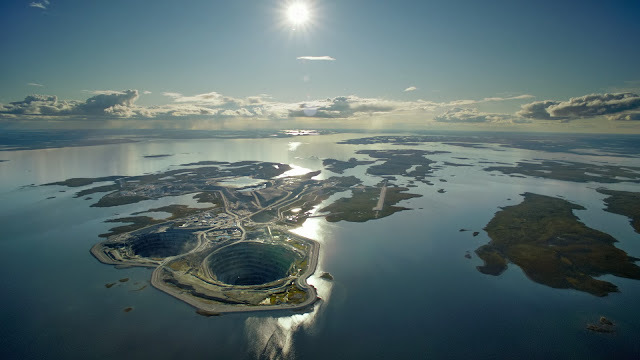 You can read up on the history of De Beers on how they controlled the supply of rough diamond and their famous marketing line, "Diamonds are forever". Even after the monopoly has ended, the "the bigger diamond, the better" thinking continues on. Diavik diamond mine in Canada - How deep is your love? Diamonds itself is not expensive. Synthetic diamonds and rough diamonds are used as an industrial tool for cutting and abrading. They cost less than USD $1 per carat. Now, compare this to the $8000 per carat diamond you are putting on your lady's hand - keep your jaws on. The high price actually comes from the characteristic of the diamond. A diamond that is closer to the perfect form is rarer. And we all know, the rarer the object, the higher the price you have to pay. I was served by the friendly bespectacled Aaron at Jann Paul on my visit. After confirming that I knew almost nothing about diamonds, he went on to teach Ellis and I on how to evaluate diamonds. It was an interesting one hour session of looking and comparing the diamonds under the many scopes. The 5Cs of a diamond are its cut, clarity, colour, carat weight and certification. Girls like to compare the carat weight of the diamond because it's the most obvious aspect. Anything that is bigger is better, isn't it? During my lesson, I learn that the cut is the most important. It helps to bring out the brilliance in a diamond even under normal light conditions. The most common cut is the hearts and arrows also known as the brilliant cut. 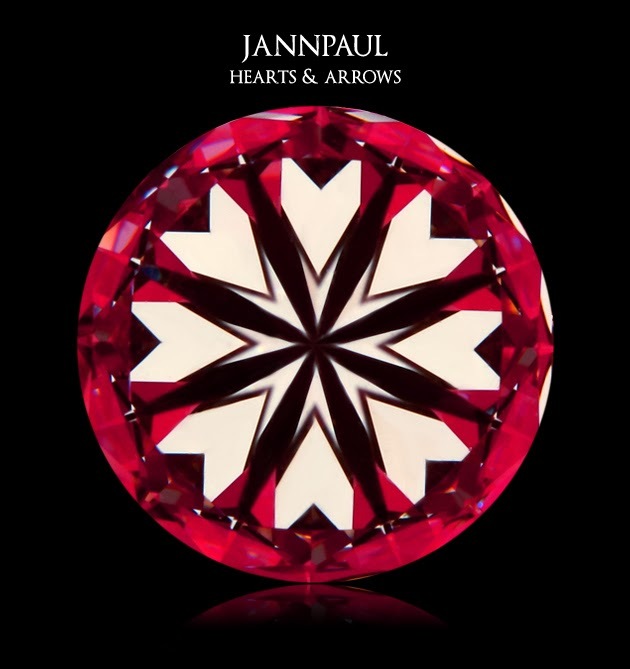 By using a Hearts and Arrows viewer, I was able to see the hearts from the bottom of the diamond and the arrows at the top. In an ideal cut diamond, the hearts are symmetrical and similar to one another. There are eight hearts on the bottom and eight arrows at the top. The hearts are seldom seem because the view is from the bottom of the diamond. However, I agree with Aaron that the hearts view are more interesting to look at. Next, I looked at the diamonds using the Aset scope. The scope measure the light return performance of the diamond. If you look at the image below, the red region represents intense light return so you want more of that. The white region represents leakages and you want to have as little of that as possible. As you can see, my diamond has a very ideal light return performance. A poorly cut diamond will a lot of uneven light leakages which I saw for myself when Aaron used the Aset scope on another diamond. The retail shops will tell you about the colour, clarity and carat of their diamond. But they will seldom talk about the cut, much less show it to you using the Aset scope. Putting a diamond under an Aset scope is like seeing a girl without make up - all the flaws are immediately revealed. Knowing this, the shops flood all corners with bright lights to make the diamond sparkle. An ideal cut diamond will sparkle more under than normal lights. Apart from the time-tested hearts and arrows, there are different cuts to consider. There is the princess cut which is squarish. There is also the Solasfera which is a newer cut that is more expensive. It is more brilliant than the H&A as it has more facets to reflect the light. After the cut, comes clarity and color. Clarity is about clear the diamond is, whether there are any inclusions and blemishes. Clarity is graded on a scale of eleven: Flawless, Internally Flawless, VVS1, VVS2, VS1, VS2, SI1, SI2, I1, I2 and I3. My selected diamond, rated as VS1 (very slightly included), contains feather and needle that I was able to spot under the scope. Feather and needle are the terms used to describe the inclusion which means very thin impurities. As I learned, it is more important the inclusion do not appear at the edges of the diamond. Until constant wear, the inclusion may become a crack in diamond. The color of a diamond grades from D to Z based on the GIA rating. A to C are not used as it was inaccurately used in the past to grade diamond. D represents colorless and it is the best you can get. The lower down you go on the alphabet scale, the more yellowish you get. 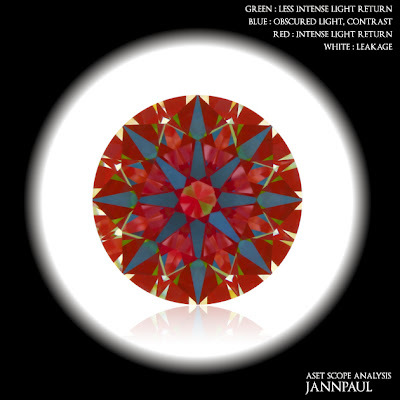 Colored diamonds like pink and red are a different class and is more expensive. D E F is the range most people will strive for. Ellis settled for a G and went for a bigger carat. As for me, I could not tell the difference between a F and G.
There are several companies that will independently grade the diamonds. The reputable ones are Gemological Institute of America (GIA), American Gemological Society (AGS), International Gemological Institute (IGI) and the European Gemological Laboratory (EGL). The most common ones in Singapore are the GIA or AGS certificates. This is a screenshot of my certificate taken from GIA online. There is a serial number on the certificate that must match the number engraved on the diamond girdle. Using a machine to magnify the engravings, I was able check that the diamond matches the certificate. When making the down payment, the serial number will be written on the receipt too. After selecting the diamond, it's one to the ring design and this is the fun part for me. If your girlfriend is not with you for this, you should try find out her ring size before this. 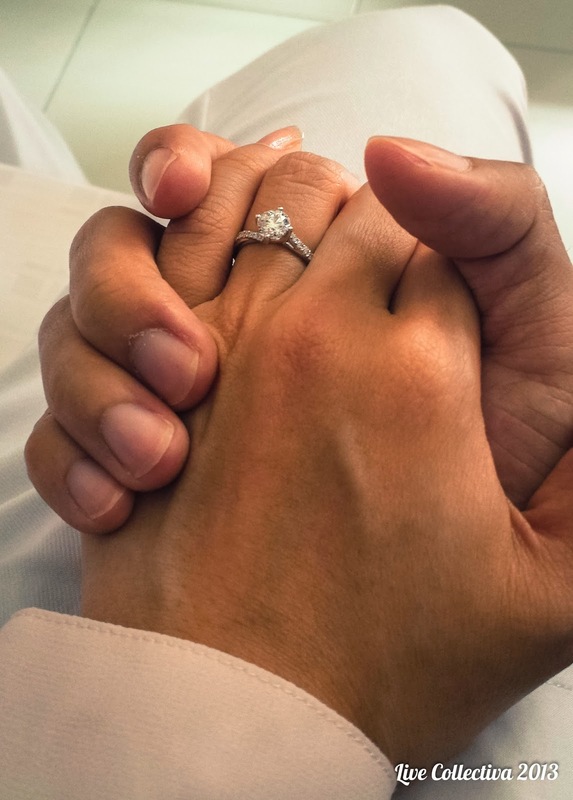 One method is to take her existing ring and see which finger it fits on yours. Or you can secretly measure her finger while she asleep. Okay, that's creepy. For me, I brought Ellis along because I wanted her to choose. There is a lack of surprise but if she is going to wear the ring for many years to come, it should be something she fancies. And I still managed to surprise Ellis with my proposal. Choosing the ring setting is where the custom jeweller shines. If there is a particular design that you want, you can have it. You can also take an existing design and make minor tweaks from there. For example, you choose a four prongs design which shows more of the diamonds from the sides or a five prongs one that hold the stone more securely. The tip of the prongs can be made a heart shape too. The ring can have twisted metal embellishments and side diamonds. Ellis and I wanted side diamonds and it costs about $1000 to $1500 more. For the metal, you can choose between white gold and platinum (more expensive, duller). The customization you can have is endless as long as it is within the physical limits. The designer will draw the ring design in CAD and then generate a 3D rendering for your preview. Until you give the go ahead, you can continue to make changes. For example, I went through three changes before settling on the final design. Jann Paul was accommodating to my changes and was not pushy at all. Ellis and I took one month to decide on the final design. And then it was another month before the ring is ready. Aaron also emailed me the scope images of the diamond which I liked a lot. Jann Paul gave me a svelte black box to store the ring. 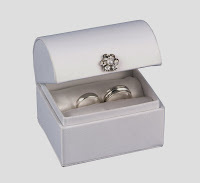 Ring boxes can easily be found online that will not break your budget. 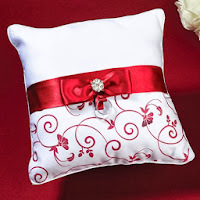 For example, this is a white satin ring box (USD $14) if you prefer a color other than black. When it comes to proposing, you can use accessories to spice up the presentation. You can do the classic going down on one knee, opening up the box in front of your girlfriend and popping the question. Or you can brainstorm ideas and create a unique proposal. Some rose petals and a ring pillow can be a good idea if you are proposing in a hotel room. 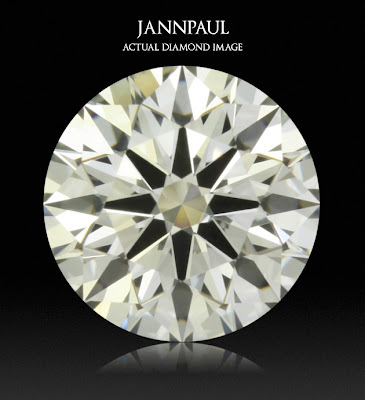 If you wish to pay Jann Paul a visit, you can give them a call (6235 2897) to make an appointment. I highly recommend you check out their Facebook page as they post pictures of completed rings. 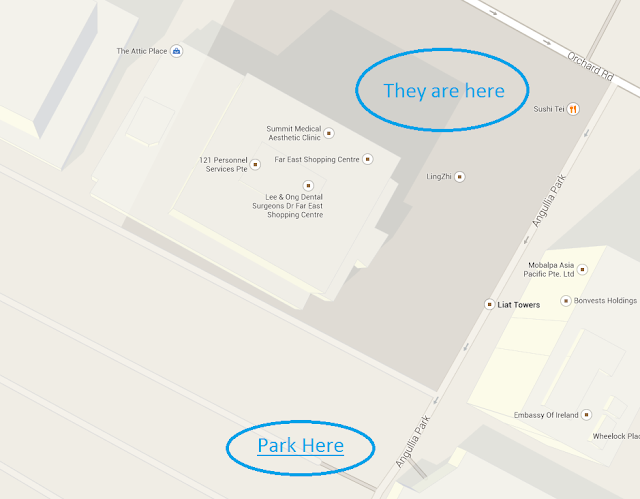 They are located at 545 Orchard Road, Far East Shopping Centre, #01-23 which is also known as House of Hung. If you are going by public transport, take a train to Orchard station. If you are driving, park at the open air carpark along Angullia Park road. When it comes to choosing the engagement ring, it is best to consult your girlfriend or at least have an idea on what she likes. Coloured gems are all the rage now while the diamonds are a classic. Ellis and I are really happy with the diamond ring we got. The price of a diamond ring is high but the smile and happiness on the Ellis' face is priceless.